Public Relations is an ever-growing field in the United States, and degree programs have seen a major upturn in enrollment. With the possibilities afforded to international students, a degree in public relations is a great option for interested students. Major companies in the US are always seeking additions to their public relations teams in an effort to keep a positive public image. The increased demand for public relations professionals has allowed recent graduates ample opportunities in the United States. Every major company — no matter the industry — needs a public relations team to tackle pressing issues about the current state of their image. In addition, the rapidly growing social media area calls for public relations professionals to promote company values using the newest technologies. Just recently the oil-spill in the Gulf of Mexico by BP oil sustained a slew of negative images towards the company. BP's PR team jumped into action to help promote the increased environmental efforts the company was making to rebuild the Gulf Shore. Public Relations graduates were on the front line of defense in the efforts. International students are widely sought by major companies because of their language skills and leadership ability. International students help companies reach a world audience in an increasingly globalized economy. The United States is the top choice for international students interested in Public Relations because of the variety of degree programs offered within a multitude of colleges and Universities. Most colleges and universities offer some sort of public relations degree through their Communication's college or program. The top university's to study Public Relations in the US are usually located in large metropolitan cities with major Public Relations industries that offer a great environment and culture to international students looking to explore while studying. The University of Southern California	offers a Public Relations program, not far from the booming city of Los Angeles. Likewise, the University of Texas at Austin	offers a top-ranked Public Relations program which aims to place students in the Austin, one of the best cities for new Public Relations and Advertising students. The variety of careers available makes the ability to study public relations an enticing pursuit for international students. 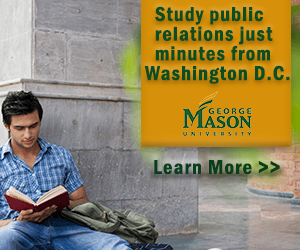 Graduates with public relations degrees can work as PR managers for major PR firms and private companies. Likewise, many celebrities and famous figures hire public relations specialists to promote their public image. Some PR graduates go on to work in media relations positions for news organizations. Others choose to follow the path into politics where they work as strategic managers for candidates or seated officials. Political campaigns are always in the need for seasoned public relations professionals to assist candidates with press coverage and media attention while creating a positive public image. Other graduates go on to work in the private sector working as investor relations managers, consumer relation professional and crisis management personnel. Whatever your goal, a degree in Public Relations while studying in the United States can open endless possibilities for international students. The need for intelligent and educated public relations is at a peak, and the opportunities afforded to educated graduates provide excitement and challenge.